Over one and a half MILLION cyphers! I love giving my players cyphers that are at least a little bit randomized, but are still tailored to be approriate for the setting, character, and circumstances. 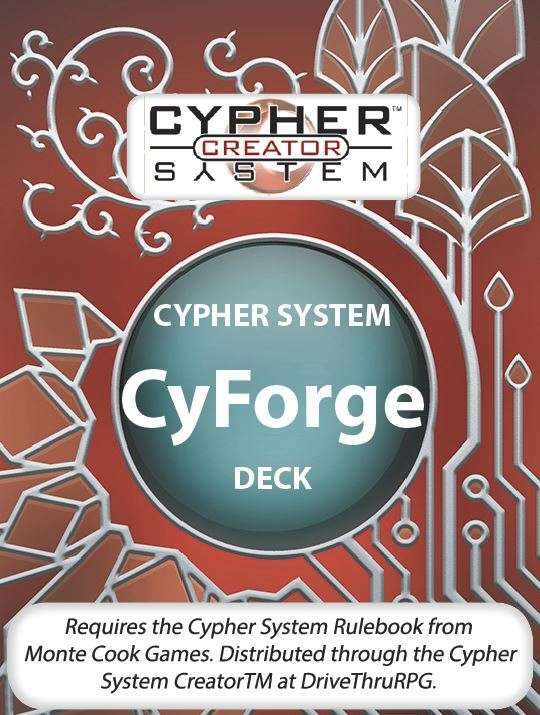 Tables and charts full of specific cyphers tend to make that difficult, so I put together the CyForge, a deck of 120 cards that provide inspiration, rather than rules! Each card has a verb to suggest an action or effect, a suggested form for the cypher to take, and an image to spark your imagination. Draw one card for each, and you have one of 1.728 million possible results, even before you apply your interpretation. The image on the card could represent an effect, a target, a form, the ideal use of the cypher, or anything else! For more randomizer decks with a large number of image and text generators, check out the GameMaster's Apprentice and Deck of Tales by Larcenous Designs, LLC! Also, if you like the art of the CyForge, you should know that the vast majority of it is available, for you, for free, from the amazing folks at www.game-icons.net! Creators Delapouite, Lorc, Skoll, Faithtoken, and Willdabeast (along with others who contributed even more icons--far more than could fit on these cards!) create thousands of game icons, all available under the CC BY 3.0 license at http://creativecommons.org/licenses/by/3.0/. Even if you don't purchase this deck of cards, you should go and check out their work, especially if you, too, are an independent game designer!